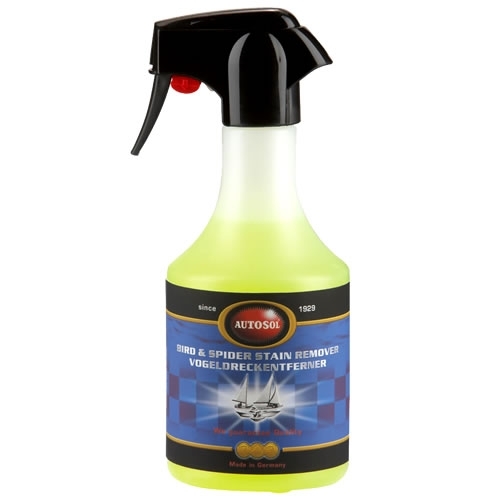 This non-toxic cleaner utilizes a formula specifically created to remove stains left by either bird droppings or spider residue. First removes all solids from the surface to reveal any remaining stains which are then taken care of. Just spray on and the product with begin to dissolve and break down droppings immediately. Won’t harm surfaces or remove polish or wax. The gentle formula simply removes droppings quickly and easily, leaving the rest of the surface intact. This product can be applied to all marine surfaces including gelcoat, paint, vinyl, sunbrella and other fabrics used to fabricate marine enclosures, including Eisenglass and other clear enclosure materials.